'The Latest Dance': West Germans greet rock 'n' roll in the 1950s: the ebullience of the dance craze popularized by Rock Around the Clock. 'Rock Around the Clock' was the first movie about rock 'n' roll, but not the first music to have rock 'n' roil on its soundtrack. The movie was an international phenomenon, with sold-out sessions in every country. Photo shows the scene outside an Amsterdam theatre. 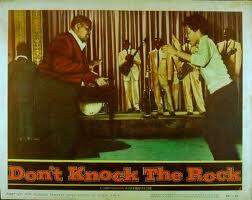 'Rock Around the Clock' popularized rock and roll dancing . 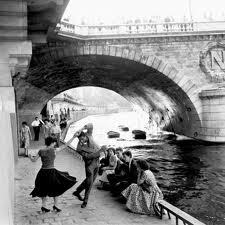 In this 1956 image, Parisians hold an impromptu dance session under one of the Seine bridges. Rock 'n' roll music and dance was never a sudden irruption. Its style and techniques owed much to the earlier jitterbug craze, LIke that music, rock was spread in the fifties by radio and jukebox. 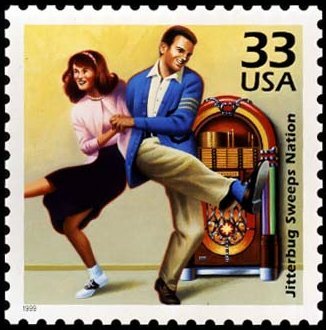 DEcades later jitterbugging had achieved sufficient respectability to be featured on US stamps. More than a half-century after its release in 1956, a low budget B-grade movie shot in a few weeks with a cast of virtual unknowns, has achieved iconic status. 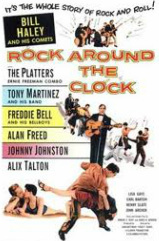 It is now an important twentieth century cultural artifact - the first movie based on rock 'n' roll music.Its title derived from the 1955 recording of Bill Haley and the Comets' song 'Rock Around Round the Clock', made popular by its appearance on the soundtrack for the previous year's Blackboard Jungle, a movie about juvenile delinquency in New York's schools.The film and its music was tremendously popular. not only in the USA but throughout the western world. Although disk jockeys, juke boxes, and records conveyed rock 'n' roll to millions of listeners, Rock Around the Clock was the catalyst that drew attention to this latest genre of American popular music. One of the myths about Fred Sear's movie is that its appeal was confined to teenagers, and that it was rejected by older viewers. In fact, from the beginning it received praise from many traditional critical sources. This included Variety, the Bible of Hollywood movie critiques. That journal praised the movie and its music: "Takes off with a bouncy little beat and never lefts up for 76 minutes of foot-patting entertainment." This view was supported by a surprising number of critics in Britain, Europe and Australasia, who rather wistfully praised the film's vigor and pace, and commented favorably on its musical and dance numbers. A study of articles about the film's reception overseas shows that its audiences were not confined to teenagers, but included a range of ages. Rock 'n' roll, in fact, was not a sudden arrival on the musical/dance scene, nor did it appeal solely to teenagers. It had its roots in forties big band music and jitterbugging, as well as the gradual emergence of rhythm and blues and its variants. People in their twenties and thirties (and older) realised that much of the music and the dance moves derived from the music of their own teenage years. For example, the German visual above shows a range of age groups frenetically engaged in the rock and roll craze inspired in West Germany by Rock Around the Clock. And the prevalent myth that the movie demonstrated a rift between the social and musical values of teenagers and the older generation is nonsense. The film was produced, directed, edited and shot by people in their forties and older. Bill Haley was almost thirty, bespectacled, plumpish, and avuncular in appearance and manner; some of the Comets were parents in their thirties. The prevailing message of the film is that the older generation,once they listen to and watch rock 'n' roll will accept it and even endorse it as another expression of American culture, one with links to the music that they enjoyed as teenagers. The movie's theme is not one of rebellion or anger between generations; rather, it is an earnest plea for mutual tolerance and understanding. Another myth, frequently repeated in social and cultural histories of the 1950s, asserts that showing of the movie were accompanied by violence and vandallism, as the youthful audiences, inflamed by the music, danced in the aisles, destroyed seats, lit fires and rioted inside and outside cinemas. In England, for example, teenagers were arrested for disorderly behavior. There were claims of rioting in Hamburg and Amsterdam and other European cities, and disturbances in Sydney, Australia. Yet there is little evidence that police arrested many miscreants, or that disturbances were caused specifically by excited reactions to the film's music. Places of public entertainment in London, Birmingham, Hamburg and Sydney had seen drunken misbehavior before Rock Around the Clock and would again after the movie had departed. 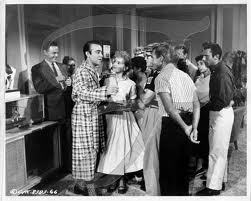 Such was the success of Rock Around the Clock that within weeks Katzman and Sears filmed a successor, Don't Knock the Rock. This also featured Bill Haley, Alan Freed and included Little Richard and the Treniers, a black group with roots in jump blues and rhythm and blues. The plot concerned itself with a small community's response to rock 'n' roll. It went to pain to show how some of the older generation combined with the town;s youth to overturn prejudices about the music and to accept it as a vigorous, enjoyable expression of evolving musical tastes. The film also showed white audiences enthusiastically applauding black performers. Sam Katzman never reached the status of A-list produers like the Weinstein brothers or Sam Spiegel, or even his fellow-B-Movie producer Roger Corman, who copied many of Katzman's money and time saving methods on set. Yet he deserves an honorable place in Hollywood history. Starting out as an errands boy at a low-budget studio, he gradually became an independent producer. By the forties he was producing movie 'quickies', the staples of Hollywood cinema: serials, and cheaply made B movies, often shown as part of double bills.By the late forties he was contracted to Columbia to make comedies, thrillers, horror movies,detective movies, and musicals. The most famous of the latter was Rock Around the Clock. This movie was hardly an innovation for Katzman, or Hollywood. During the 1940s producers like Katzman churned out musicals for adolescents, testing the reaction of audiences to mostly young, up-and-coming performers, singing and dancing in high school or other adolescent-centred settings. Examples include 1942''s What's Cookin', starring the then popular singer Gloria Jean and highlighting the abilities of a young Donald O'Connor,1943's Mister Big [see clips below] Since the mid-1940s Katzman had been making several such movies, such as Junior Prom . His movies were even known as the 'Teen Agers Series'. He also specialized in making movies based on currently popular news items. These included movies about the Korean war, juvenile delinquency, flying saucers and new trends in music. Ten years before Rock Around the Clock, his 1946 musical I Surrender Dear, with the once popular singer Gloria Jean focused on the phenomenon of disk jockeys in the music industry.Its plot was a template for the Haley musical: inter-generational misunderstandings about popular music that are eventually reconciled in a spirit of mutual acceptance. During the 1930s and 1940s Katzman made a series of profitable serials, the most popular probably being 'Jungle Jim'. Katzman seized on concerns about juvenile delinquency to make a series of films about the alleged teenage crime wave of the fifties. Flying saucers - another post-1945 era concern exploited by Katzman in his movies. Posters for Katzman's movies promised explicit excitements that were considerably muted in the actual movie.